What do Edward Snowden, Frank Serpico, Daniel Ellsberg, and Richard Bowen Have in Common? 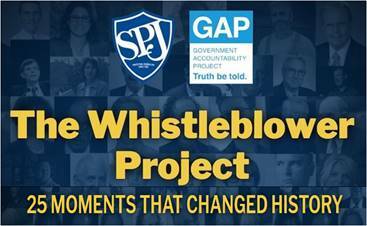 A collaboration between the Society of Professional Journalists and the Government Accountability Project, The Whistleblower Project, which focuses on journalism and democracy, just announced one of their initiatives, 25 Times Whistleblowers Changed History, and I am named as one of the whistleblowers they feature. 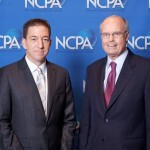 Some of the best known, Sherron Watkins of Enron, Daniel Ellsberg of the Pentagon Papers, Dr. Mona Hanna-Attisha of the Flint Water Crisis, Frank Serpico, referred to as the “godfather of whistleblowers,” who exposed the widespread corruption within the NYPD, and of course Edward Snowden, and the National Security Agency’s blanket surveillance of United States citizens exposure, are household names. Frank Serpico, a New York Police Department (NYPD) plainclothes officer, worked with investigative journalist David Burnham of The New York Times to expose widespread corruption within the NYPD in the late 1960s and early 1970s. Serpico’s disclosures led to the formation of the Knapp Commission which ultimately revealed systemic corruption within the NYPD. 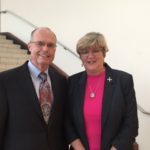 Dr. David Graham’s disclosures resulted in Merck pulling Vioxx off the shelves and exposing the FDA’s bias in favor of pharmaceutical industry interests over health science. 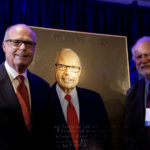 Casey Rudd’s disclosures about the Department of Energy’s Hanford Nuclear Site, its safety violations, and the risk of the nuclear explosions it could lead to ended the production of plutonium at the site in 1988. And the list goes on. I am lauded for Blowing the Whistle on Defective Mortgages , the $90 billion of mortgages Citigroup was buying annually from Countrywide and other lenders which led to my testifying before the Securities and Exchange Commission in 2008 and the Financial Crisis Inquiry Commission in 2010. The SEC and FCIC hid my testimony, with the FCIC also forcing me to change my testimony. That commission, led by former California Treasurer Phil Angelides, was critical of the Fed’s role and of the general attitude that the crisis was someone else’s fault. “You could’ve, should’ve and you didn’t” clamp down on subprime lending even after Fed staffers recommended it”, Angelides told Alan Greenspan, the former Federal Reserve Board chairman. The Whistleblower Project asks that journalists be aware that a whistleblower is taking a great risk in coming forward, and should do all that is possible to protect them. It is doing its best to inform them and the public about the insidious attempts to retaliate against whistleblowers. As those of us who have taken the risk know — if we expose wrongdoing we can face job loss, lawsuits and even prison. The result was that she was found guilty of 22 counts related to the unauthorized possession and distribution of military and diplomatic documents and was sentenced to 35 years in military prison, but was acquitted on the worst charge, aiding the enemy. Among other things, the Whistleblower Project collaboration has teamed up with several other whistleblowing and media organizations to inform journalists on how they can safely work with whistleblowers. It’s offering the best practices for journalists to follow when working with a whistleblower on a story. And it’s created a comprehensive case for why those who risk everything should be praised, better protected and supported, and calls for legislation to improve protection for whistleblowers. I could go on; however, you may want to read more on your own. The stories of other whistleblowers who have helped shed light on corruption, government waste, and injustice, as well as the reporters who work with them is inspiring. I am honored to be part of such a courageous team of people. – Now We Know — The DOJ Ignored Two FCIC Citi Criminal Referrals! – A Case Study on Enron: How to Destroy a Company! 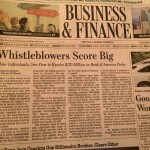 – Does Whistleblowing Pay? New Study Says Yes! Warning Danger Ahead! Whistleblower Options Are Being Shut Down!